Our day with Vivian in Mindo was amazing! She is an engaging travel companion full of interesting stories that illuminate the history and culture of her beautiful state. She is also very thoughtful - making sure the little things like bathroom breaks (with tp provided) are fit in easily. The tour included several stops, including the Pululahua Geobotanical reserve, a coffee shop with a delightful hummingbird garden, hiking to spectacular waterfalls, the butterfly reserve and chocolate. Fabulous! TOUR GUIDE RESPONSE: Hey again Bruce and Andrea! You know I loved you two, being with you for another day, taking you to Mindo, one of my absolute favorite trips in all of Ecuador. The secret, little, roadside, mountainside, coffee shop with the hundreds and hundreds of hummingbirds flitting around is my U.S. husband's favorite place, and he sometimes asks me to take him there for a romantic late afternoon trout dinner on the patio with the birds. Yes, I ALWAYS have a roll of toilet paper and a roll of paper towels stashed! Vivian was a delight. She was early for our tour and very flexible on what to do and when. It was a Sunday and a beautiful clear day, so she quickly prioritized events for us to maximize the views and options. Knowing we were adventuresome and plant lovers, she fit in an exotic foods festival at the Botanical Gardens. Teleferiqo and the swings were a real treat. When we entered the cable car, she made sure we had the best views of Quito both up and down. I would highly recommend her services! Our day to the real equatorial line and Mindo Cloud Forest was a delightful end to our 10 day trip to Ecuador. Spending the day with Vivian was like touring with a trusted friend- with answers to all our questions and heartfelt relationships with everyone we encountered. Highly recommend the chocolate tour in Mindo. I just want to recommend Vivian for anyone who wants a thorough understanding of the government, the people, and the history of important people and events in Ecquador. We had an individualized tour which included meeting with Ecuadorian artists, visiting ruins, and even climbing Cotopaxi. Vivian was always on time and so full of information that we sometimes felt overwhelmed and lucky to have such a good guide. She's the best. Vivian was knowledgeable and even emailed me a list of "Vivian's Ecuador Travel Tips" before we left with a lot of good information. We thoroughly enjoyed our day with her. This was our first outing with tours by locals. Vivian was punctual and well organized. She had a few questions for us initially to ensure this was the right tour for us. She took the time to find out our interests. We drive to the two sites where she displayed a wealth of knowledge. We then drive to the equator where we chose not to pay fees to attend either of the tourist traps. We had a marvellous lunch along the way and also enjoyed artisinal chocolate and ice cream. She was a delight! 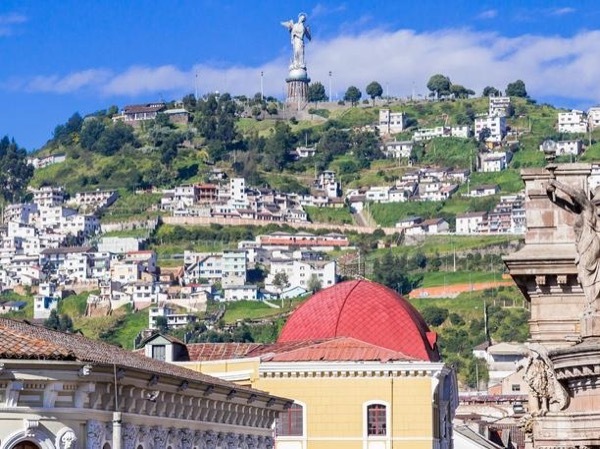 A group of four of us just returned from a trip of a lifetime to Ecuador and the Galápagos Islands, and one of the highlights was a day tour in and around Quito with Vivian. All of the other positive reviews about her are absolutely true. She is highly knowledgeable, responsive, flexible, there were lots of laughs, and her enthusiasm for showing visitors around her City and its surroundings is infectious. And when she says she is there to help anytime before and after your tour with her, she means it! Vivian was extremely knowledgable of the area and the history and a delight to be with. She was timely and responsible. We would highly recommend her. Vivian was so professional and helpful since we booked our tour. She put forth 110% effort to ensure we had the best day possible in Quito. She was organized, flexible and informative. Her transportation vehicle was top notch and her English was excellent! We were so glad we booked our day tour with Vivian and next time we are in Quito she will be our go to. Thank you Vivian for a wonderful experience! Amazing, amazing, amazing, �� Vivian is just a wonderful guide. I can't give her enough kudos. Vivian was fun and organized with a driver so she could be with us efficiently. She had listened to my interests and developed the day plan accordingly, yet checked throuout day to make sure I felt we were on track. HIGHLY RECOMMEND! Vivian was an amazing tour guide. We saw so many interesting things and laughed the whole day. She was very flexible and made sure she catered the tour to our interests. We started out as clients and ended up as friends. I cannot recommend her highly enough. Vivian is a wonderful guide! We had an amazing tour of Quito that included stops not on the "official" tour that gave us a great appreciation for the history and culture of Ecuador. She was flexible and asked a lot of questions prior to our visit to customize our tour. We hired a separate driver which I would highly recommend. It was so much easier than trying to park in the busy congested city. We are exhausted after a long day and couldn't be happier. Vivian is an excellent tour guide and made our day in the Mindo Cloud Forest an exceptional experience. She was very knowledgeable and taught us about the area in detail. We enjoyed the hummingbirds, a gondola ride, trek to the waterfalls, lunch at a local restaurant, tour of a chocolate factory, tour of an orchid garden and a stop at the "true" equator. It was a very long day, and Juilo (our driver) did an excellent job navigating the winding roads. We highly recommend Vivian and Juilo! Vivian is an amazing guide. Her enthusiasm and professionalism is first class. She went above and beyond to give us the perfect day. We visited the La Florida mummies, Cotasqui pyramids, Otavalo market and Equator line all in the one day! We are so grateful for this experience - and for the detailed way she answered our frequent questions on every occasion. She even gave us the advice we needed to make the next part of our trip as smooth as possible. We were priveleged to have her expertise. Vivian was a wonderful tour guide. She is so knowledgeable about Ecuador; we enjoyed our whole day with she and her driver. She was on time, in the lobby of the hotel before we came down to meet her for the first time, and spent more than 10 hours with us. She customized our day around what I had communicated with her when booking the trip. By the end of the day we felt as if we had known her for years. Tours By Locals is lucky to have Vivian as an employee representing the company and Ecuador. Vivian is an amazing guide! Communication with her was prompt, thorough and easy so I knew exactly what to expect before the tour. She genuinely cares about your wellbeing. She went above and beyond to maximize my time, and we saw more than I thought possible. She really knows her stuff, and is very easy to talk to. She's well known by the locals and we were always warmly received. I had so much fun the last 2 days; I can't recommend her enough! We had such a wonderful time with Vivian!! She is so knowledgeable of history, landscapes and cultures. We loved getting to hear all of her stories and facts and she took us to so many interesting places! We highly recommend a trip to Baños with Vivian!! We enjoyed the National History Museum, but the real star for us was the Guayasamin part of the tour, especially his Chapel of Man. We knew nothing of him before this tour, but his art & the peak into his life via his home was great! I'm going to write this next part 5 times, because we did 5 separate tours with Vivi. I would happily do it 50 times, because she is an outstanding guide. She's endlessly kind, friendly, & flexible - adapting the itinerary to help you get what you want most from the tour. This tour included a great walk around the central parts of Quito, plus a look at culturally & historically important sites. If you have only a brief time in the city, this would be a good choice to get the best look at it. I'm going to write this next part 5 times, because we did 5 separate tours with Vivi. I would happily do it 50 times, because she is an outstanding guide. She's endlessly kind, friendly, & flexible - adapting the itinerary to help you get what you want most from the tour. If you have even the slightest interest in birds, you must do this tour! The whole day was filled with them, the beautiful cloud forest, & much more - get out of Quito & the big city sites rut & do this tour. I'm going to write this next part 5 times, because we did 5 separate tours with Vivi. I would happily do it 50 times, because she is an outstanding guide. She's endlessly kind, friendly, & flexible - adapting the itinerary to help you get what you want most from the tour. The train gives a good look at the grittier parts of Quito & the rural, agricultural areas around it, much of it unreachable by car, but it's a very slow trip. Cotopaxi Nat'l Park was terrific, & the lunch at an historic hacienda, too. I'm going to write this next part 5 times, because we did 5 separate tours with Vivi. I would happily do it 50 times, because she is an outstanding guide. She's endlessly kind, friendly, & flexible - adapting the itinerary to help you get what you want most from the tour. This was a great way to start our Ecuador experience - the town & the market are the goal, but along the way you'll see the countryside & have the chance to see other interesting sites & have small, unique experiences that really add up. I'm going to write this next part 5 times, because we did 5 separate tours with Vivi. I would happily do it 50 times, because she is an outstanding guide. She's endlessly kind, friendly, & flexible - adapting the itinerary to help you get what you want most from the tour. Vivian was wonderful. She is quite knowledgeable, easy going, always personable, and flexible. We recommend her highly. It was a pleasure having her and our good drivers for the two tours. Amazing! Amazing! Amazing! We, 6 adults, spent 3 full days with Vivian. Vivian found wonderful restaurants for lunches and snacks - who thought one could find a fabulous pizza restaurant in Mindo. We learned about the history of Ecuador and Quito, the establishment of Mindo - we toured a Rose Farm, which was a highlight of the trip, - we saw local artisans and listened to local musicians. By the end of three days we found a new friend in Vivian and felt privileged to have had her as our guide. Amazing! Amazing! We, spent 3 full days with Vivian. He found wonderful restaurants for lunches and snacks - who thought one could find a fabulous pizza restaurant in Mindo. We learned about the history of Ecuador and Quito, the establishment of Mindo - we toured a Rose Farm, which was a highlight of the trip, - we saw local artisans and listened to local musicians. Learned, and saw, about the forests, plants, birds, hummingbirds, butterflies, chocolate, coffee and volcanoes of this region of Ecuador. Amazing! Amazing! Amazing! We, spent 3 days with Vivian. He found wonderful restaurants for lunches and snacks - who thought one could find a fabulous pizza restaurant in Mindo. We learned about the history of Ecuador and Quito, the establishment of Mindo - we toured a Rose Farm, which was a highlight of the trip, - we saw local artisans and listened to local musicians. The van provided was very comfortable and the driver excellent. We had a great time on our tour of Quito. We especially enjoyed our great view from the top of the Golden Church and our trip to the Virgin of Quito. Too bad our group was too tired from our earlier flights that day to take the Cable Car ride. Thanks Vivian! Our group of 7 had a spectacular time with Vivian and her driver John visiting the many interesting sights in the Cloud Forest. We took some great pictures and will remember this experience forever. If we get back to Ecuador again in the future we will definitely look Vivian up! very enjoyable. Vivian was very flexible with what we wanted to see. very knowledgeable. Vivian was a pleasure to be with. I had a great time spending the day with Vivian. The tour was exactly as described and definitely a unique experience. Vivian made sure to mix in some of the things I wanted to do. I'm already looking forward to my next visit. Thanks! This was a great tour with Vivian. Vivian worked with us to identify the sites and activities that we wanted to do while in Quito. We took her suggestions and modified them so include some other activities that we were interested in. Vivian worked with us to make it all happen! Vivian arrived promptly, was attentive to our needs throughout the day and it was a pleasure to spend the day with her. Great day trip! We did some hiking, had coffee with hummingbirds, visited a butterfly farm, saw different kinds of orchids/ flowers, had a wonderful lunch, enjoyed a chocolate tour/tasting and finally more birds and coffee! She delivered us to the airport at the end of the day. Vivian was a wonderful guide—professional, easy to talk to and knowledgeable. Vivian is the very best tour guide you'll ever want to meet! From pick up to drop off, one could not ask for a more wonderful experience. Her driver, Lupe, was a delight and a great driver, too. I found Vivian online through this website. What a gift. She is knowledgeable about Ecuador and is so bright and so much fun to be around. It almost doesn't matter where you go with her. You'll be in good hands. Yunguilla was quite interesting nonetheless! We had a fantastic tour by Vivian. There were 5 of us so we had a van and driver as well. Van was excellent with a very professional driver. Vivian was great. Professional, yet easy going and friendly. Very knowledgeable of the area. She took us to some great places and we had some great food as well. She was able to customize the tour as we went, staying longer in some places or shorter in others. I would strongly recommend her and the Mindo Cloud Forrest tour. Vivian was the best! She has a super wide range of information about Equador, she's very pleasant, and an absolute pleasure to spend time with! We had the best couple of days with her and we enjoyed every second! I would absolutely recommend her to all my friends and family and can't wait to return! Vivi was FANTASTIC. My daughter (14) and I had a wonderful time, seeing all the best Quito has to offer. Vivi is extremely knowledgeable and friendly, and taught us a great deal. She also sent us a wealth of helpful tips in advance of our trip. It was a pleasure to spend the day with her -- she was easy-going and fun and made sure we were doing what made us happy. Could not recommend any more highly. Where do we begin...We had SO much fun with Vivian and her mother the chauffeur! Vivi did an amazing job customizing our day per our interests. Whether it was visiting historical sites or finding a quaint empanada restaurant, she did it! Vivian is truly an outstanding and professional tour guide. Thanks for providing us with so many fond memories of Quito! The tour guide is often as or my important as the tour and Vivian was wonderful. She was very responsive to my questions before the trip and arrived at the hotel right on time. Vivian was friendly, knowledgeable, flexible and a joy to spend the day with. The hummingbirds were AMAZING! I have never seen such a profusion of these lovely little birds. This is a bit late but we loved exploring Quito with Vivi! We had two day long tours arranged with her, and she was not like a guide, but a good friend who had amazing knowledge of the area. We hiked together at the Cloud Forest, had delicious local meals, went to an extraordinary Coffee house with a surreal backyard with humming birds and a breath taking Mountain View, had our spirits cleansed by Pacha Mama communities and went to Otavalo for drop-dead shopping! Vivi is a treasure, and we were so lucky! My wife and I are senior travelers. For this trip, we also brought our 2 teenage granddaughters along. Vivian had every thing planned as she told us, starting with being prompt at our hotel. She was able to engage our granddaughters as well as talk with us. She led at a comfortable pace, and made sure we got the experience we wanted. She was very pleasant and easy to converse with. we highly recommend Vivian! Fantastic day exploring Quito. We were so well looked after and packed so much in. We were treated to so many special moments in this vibrant and friendly city from the delicious tastings in the fruit market to the wonderful churches, gorgeous vistas from the cable car, the equator and so much history Vivi shared with us as we went about about old Quito. Thank you Vivi and thanks also to your lovely Mum who drove us which helped get us around with such efficiency and ease. There is nothing that we can say about Vivian that hasnt been said 1000 times, but we would be doing a disservice if we didn't reiterate how incredible she is. She has a passion for this country that is unmatched and knowledge that can only come from decades of experience. She knew all of the hidden stops in our Mindo trip that will no doubt become big themselves someday and I felt like we got the perfect insider tour. If she is available, don't wait, book her ASAP! Thank you Vivian from your Tenn. boys! 5 Stars is not enough for Vivian. She personalized our trip, adapting the itinerary even at the last moment to our whims. She made special arrangements for us (such as having places open up even on Mondays so that we wouldn't miss an amazing coffee or meal). She knew just who to call when we wanted an activity (mt biking), and was amazingly friendly and helpful throughout all of this. We're coming back to do some more touring, this time with our spouses! We love Vivi! From the start of our day with Vivian we were treated like family friends as she showed us sites near Quito & Mindo. In e-mails prior to the trip Vivian offered ideas on what one could do for the day & Ecuador travel tips. We provided her with what we wanted to visit. Stops included Pululau volcano, a hummingbird garden cafe, private bird sanctuary, waterfall hike, butterfly garden, and chocolate production. Our kid wanted to try cuy & our last stop was the diner where Bizarre Foods had eaten. Great Day! Vivian is a great guide! Her English is excellent. She was very responsive in helping us plan our tour and she customized our tour based on our communications before our trip. We were very happy with the tour she arranged. She arrived on time, has a good car, was a good driver, is knowledgeable and pleasant company. We spent three days touring with her and had a wonderful time. I doubt there is a guide world wide who could be any better than Vivian V. From our first contact until the end of a wonderful day with her, our experience could not have been better. She provided us with a great deal of advice on our visit to Ecuador. She recommended what clothes to bring, how to prepare and made some truly wonderful recommendations. She tailored the day to our interests, was very knowledgeable, enthusiastic, and has our highest possible recommendation. We took the train to the volcanos, drove on to Cotopaxi Volcano, hiked for 2 hours with a stunning view of the volcano! The hike is challenging... a 25-30% grade, terrain of tricky lava sand, at an altitude of 16,000 feet!! It was a fun challenge, with otherworldly and spectacular views.. Plus our guide was with us the whole time and so helpful.. We had a late lunch at a beautiful 500 year old hacienda afterwards to complete another perfect day with Vivian, our amazing guide. Fun to stand on the actual equator! And we loved the rose farm visit....it was fascinating and so beautiful! Vivian gave us so much wonderful information about the history, politics and culture of Ecuador...she has studied so much to be able to do this really well, and we so appreciated all the fascinating facts. She is amazing. We aren't shoppers, so Otavalo was not our favorite, but the scenery around there is beautiful. We viewed a volcano crater in which people live, hummingbirds sat on our hands, we saw otherworldly huge tropical flowers, gorgeous butterflies landed on us, we ziplined over the cloud forest with such competent instructors, we learned how one of the rarest chocolates is made in a tiny factory, and drove through the stunning cloud forest landscape. Our guide, Vivian, who now feels like family, was so well informed, delightful, charming, enthusiastic..we felt so lucky to have had her as our guide!!! Vivian was wonderful! She communicated well, was prompt, fluent in English as advertised, and planned a magnificent day for us. We saw so many hummingbirds, went hiking, saw waterfalls, Pululahua volcano, cloud forest, tasted wonderful Ecuadorian chocolate and coffee, toured a farm and a butterfly garden. She even gave us a short tour of Quito. She had a lot of knowledge about the area and answered all our many questions. We left as great friends! Definitely worth every cent we paid. We could not have been more pleased with our tour today with Vivian and our driver Vladimir. Our itinerary was tailored to our interests and we felt that we had an authentic Ecuadorian experience. This tour was great value for the money and Vivian was a wealth of information on all aspects of Ecudorian life. From the equator visit to the Otavalo market to the rose farm and then the traditional Ecudorian meal, we couldn't have had a better introduction to our South American trip. Thanks Vivian. Vivian was amazing with her flexibility and most importantly her fountain of knowledge of Quito and Ecuador. She made our one day in Quito memorable. Vivian is a very personable and professional guide with excellent English skills and exceptional knowledge of Ecuador. We exchanged a few emails and she put together a fantastic day in the highlands north of Quito based on our personal interests. She provided us with some great travel tips before we left the US and surprised us with a few extra treats during our time together. What a great start to our time in Ecuador! Highly recommended. Outstanding! Vivian was beyond accommodating for our 3 generational family of 10 tour. Her tour was so educational for all of us with a tour of a small local rose producer who sends flowers all over the world (even the males enjoyed it!). Next we visited a hummingbird reserve and finally had lunch and a private excursion to the Papallacta Hot Springs where we hiked and then luxuriated in the hot springs. Vivian and her driver, Hannibal were absolutely the best! We were so lucky to book Vivian to tour our family of 6 for a week from Quito to Guayaquil. Vivian is a wonderful communicator and extremely flexible with plans and ideas. She also organised a fantastic driver Havier and a fabulous large bus. She is extremely knowledgeable about her beloved Ecuador and her enthusiasm and constant smile is contagious. We have also fallen in love with this wonderful country and it's fabulous people and can't thank Vivian enough for showing it to us. We enjoyed our time with Vivian very much. She is very knowledgeable and is fun and happy. She is a joy to spend time with and knows Quito very well. I would highly recommend her. There are not enough stars to give Vivien! She was absolutely AMAZING! Incredibly helpful with hints, tips and answers to my many questions before our trip. She was knowledgeable and accommodating adjusting the tour when my mother was hit with altitude sickness. Thank goodness we booked with Vivien and TBL rather than a big group! Vivian's first priority in her tour is ensuring your safety. She is upbeat and happy to talk about anything related to Ecuador that you are interested in. She is also flexible in the tour. We had wanted to do some hiking at Cotopaxi instead of spending more time in Banos, and she worked with us to make those changes to the itinerary. This tour was a great opportunity to see both the Amazon rainforest to the Andes to the volcano at Cotopaxi. Really great to see such different parts of Ecuador. Vivian is an amazing, knowledgeable tour guide and we highly recommend her! She is one of the best guides we ever had. She is flexible, easy going and a joy to travel with. We enjoyed traveling with Vivian 3 days. We stopped enroute to have breakfast at a special place with hummingbirds, hiked to a waterfall,visited the Pululau volcano rim, and toured a charming chocolate factory. All were special places we never would have known about without Vivian to guide us on our amazing journey. Thank you, Vivian! Vivian is an amazing tour guide, and I recommend her highly! Her explanations and knowledge are exceptional. She tailored the day to our interests, and took us to many interesting sites both in the city and on the outskirts. She had her mother drive us so that we could go to sites and be met afterwards without parking. Vivian thinks of everything and took excellent care of us! We drove up to the Virgin statue and went on the Teleferico. She was flexible and a joy to be with. Thank you for a great day! Vivian is an amazing tour guide! She is knowledgeable, fun to travel with and very generous with her time. She tailored the day to what we wanted to do, and took us to special places we never would have found on our own.Vivian and her driver picked us up right on time and took us on a great adventure, including an Andean bird aviary, a weaver in Peguche who wove beautiful wall hangings, an instrument maker, and the Otavalo market. A long, fantastic day we totally enjoyed! Thank you! What a wonderful experience! Vivian was a fabulous guide; she greeted me the second I stepped through customs and we were immediately off on a wonderful adventure. She had clearly listened to my requests and planned an itinerary that was perfect for me. Vivian was cheerful, friendly, flexible, and knowledgeable. By the end of the trip I felt like I had gained a friend, and had an experience I would never forget. I highly recommend Vivian, and also loved the beautiful and friendly country of Ecuador. Vivi is a pro. Very knowledgeable and personable. Went above and beyond in every circumstance. Highly recommend her. OUTSTANDING GUIDE! We were a 3 generation party of 7, ages 7 to 77 and Vivian was great with our active children & considerate of age 77 limitations! She planned great transportation, itineraries, activities and places to eat! Thank you Vivian for a terrific 3 days in Ecuador. We had the best day with Vivian. She is a first rate professional who customized the tour to our schedule and interests. Her depth of knowledge helped us have a much better understanding of the history and culture of Ecuador. In addition to seeing the market in Otavalo and beautiful countryside near Quito, she arranged for us to visit a rose farm and family hacienda. Vivian was great with our kids and went above and beyond to make sure we had a great day. My highest recommendation. Vivian was simply one of the best guides we have ever had. She was extremely well informed, incredibly generous & flexible with her time, her decision-making, & was an absolute delight to spend time with. We were lucky to have Vivian for 3 days. We would recommend Vivian to anyone traveling to Quito Ecuador & we make this recommendation with full confidence. In almost all cases we use private guides by Tours by Locals in our adventures. Vivian was a joy! We had an all day tour with her and saw EVERYTHING there is to see in Quito and surrounding areas. She was informative and adjusted the tour based on what we wanted to see. You will be very fortunate to have her as your guide if you visit Quito. Vivian was wonderful!! I cannot say enough about her knowledge and enthusiasm. She picked us up promptly and presented Quito beautifully. Couldn't be happier. Wonderful very full day travelling to the south to the town of Banos. The high valley between towering volcanoes makes a wonderful drive. Dropping off the high plateau into the Amazonian basin is memorable. Vivian makes your learning personal. Her flexibility and knowledge helped us to understand the history and culture of Ecuador. She never tired of my endless questions. My highest recommendation - Vivian started our 3 days of tours as our guide and left as our friend. Wonderful very full day travelling to the north to the market in Otavalo, the volcano crater, the "leather" town and the "wood carving" town. Vivian makes your learning personal. Her flexibility and knowledge helped us to understand the history and culture of Ecuador. She never tired of my endless questions. My highest recommendation - Vivian started our 3 days of tours as our guide and left as our friend. Wonderful full day in Quito. Vivian makes your learning personal. Her flexibility and knowledge helped us to understand the history and culture of Quito and Ecuador. My highest recommendation - Vivian started our 3 days of tours as our guide and left as our friend. Vivian was so lovely. Knowledgeable about so many things and so pleasant. She was wonderful with my children and super helpful. All her suggestions were great. Her English was perfect. I highly recommend her. Vivian did an outstanding job with our tour. If I could rate her higher than a "5" with the stars, I would. Vivian arrived early to pick us up. She took us to all the places we signed up for and a few extras. She is a very pleasant person and seemed to smile the whole day with her enthusiasm for what she shared. She sincerely wanted us to have an amazing day, and we did. She is the best guide I've used in my travels around the world and recommend her without reservation. After returning to Quito from a Galapagos cruise, we joined Vivian for a wonderful trip into the Andes to the Papallacta spa where we relaxed with massages and bathed in hot springs pools. On the way Vivian had arranged a private visit to a rose farm where the chief gardener spent an hour giving us an in-depth tour. Fellow cruisers who had done a multi-day Amazon tour with Vivian and plan a coastal tour with her next year had raved about her expertise and effervescent personality. We heartily concur. Our Mindo trip with Vivian illustrated the value of using a guide with extensive experience and personal contacts. She got us into a hummingbird sanctuary that was closed to the public and arranged a personal tour of a chocolate-making facility because she is a friend of the owner. We also enjoyed a great hike to a waterfall in the cloud forest and visited a butterfly preserve. Vivian was wonderful throughout and was especially helpful and considerate when my wife had some difficulty during the hike. Not only was VIVIAN very knowledgeable about Ecuador's history and the city of Quito, she was very "in tune" with the kind of tour we wanted to have. I will recommend her to all my friends who plan a trip to Quito. Additionally,Vivian sent us a very detailed email with useful information regarding travel to Quito and suggestions for packing, altitude, and places to visit. She also communicated with me several times regarding the tour. Altogether our tour was a treat.